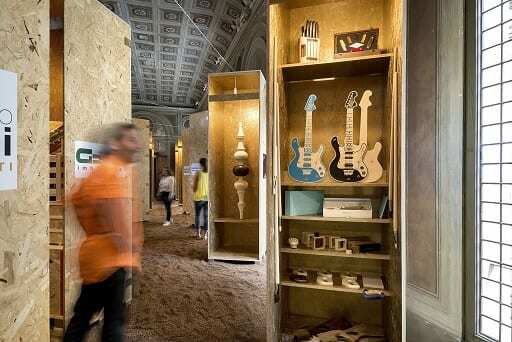 exhibition means to awaken public opinion to the use of the wood as raw material. which promotes the balance of the greenhouse effect. architecture firm, which also mount the exhibition. might seem a provocation but it isn’t and the data prove it”. Legnami, Tino Sana, Valsecchi 1918, Wood Friend. that fed: crops make the landscape”. cork field represent the rebirth of an disfigured environment due to the deforestation. preserving their primordial character”. Natalia Rota Nodari said. art, food and lots of wood, scheduled on September the 11th . Arredo, Ersaf, Afi and Comune di Bergamo. Paky from Seriate, Ellepigrafica from Curno and Diemmebi from Vittorio Veneto. Design architecture, Bergamo, design, fairs in milan, fashion week milan, furniture fair milan, italy, MaxColor, milan fashion week, Minelli, Mobilificio Fattorini, Riva Yacht, Sartirani Legnami, Società Legnami Paganoni, Tino Sana, tourism, Valsecchi 1918, wood craft, wood design, Wood Friend.